When the Nifty is being powered by a handful of stocks and individual portfolios are far from all-time highs, one needs a marvellous pair of eyeballs to become a good stock-picker. At present, with markets volatile and investors uncertain about which sectors and companies will do well, one way to sift through the rubble is to look at companies with good corporate governance standards. 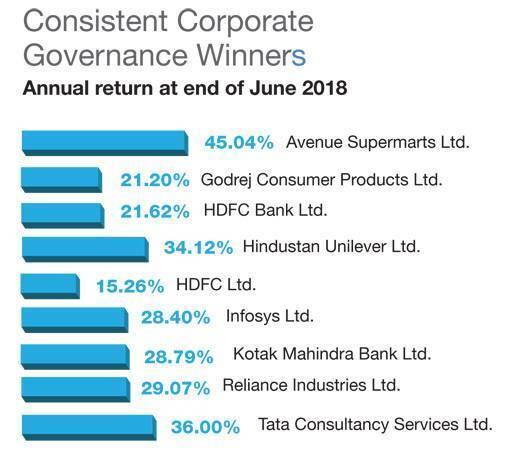 ?While every market rally throws up its own theories and rationale to justify businesses and value stocks, one simple mantra to stay in the game is corporate governance! Data shows that 66 per cent of Nifty returns between June 2017 and June 2018 have come from just five stocks. These include Reliance Industries, Kotak Mahindra Bank and Infosys, which have given 29 per cent returns each, and TCS and HDFC Bank, which have returned 36 per cent and 21 per cent, respectively. While many believe the ongoing rally in the markets is lopsided, Mahesh Patil, CIO-Equity, Aditya Birla Sun Life AMC Ltd, explains the reason for this trend. "This is because the confidence in the market is not very high due to global factors and domestic macro headwinds. So, as a flight to safety, one tends to park money where companies are safer and yet provide opportunities," he says. It is no surprise, therefore, that well governed companies like the HDFC twins, TCS, etc, provide comfort to investors. Aashish Somaiyaa , CEO, Motilal Oswal AMC, says, "Irrespective of market conditions, clearly corporate governance is a non-compromise. For example, the rally in HDFC and Infosys, among others, is clearly on account of corporate performance and relative valuations." Rajeev Thakker, CIO, PPFAS AMC, says, "If one is investing in individual companies, what matters is governance, business performance of the company and the valuation one has paid to buy the stock, and that is where the focus of analysts and investors should be." "In every phase of bullishness in the markets, there are some unworthy recipients of capital. Either the performance doesn't hold up or markets become more discerning," says Aashish Somaiyaa. Some examples include Vakrangee Ltd., PC Jewellers, Manpasand Beverages and Atlanta Ltd, among many others. Shriram Subramanian, MD, InGovern, says, "Lack of transparency and essential disclosures seemed to have pushed auditors to suspect something amiss with financial statements and so they resigned from companies like Manpasand Beverages." On May 25 this year, Manpasand Beverages was trading at Rs431 and after auditor Deloitte Haskins & Sells' surprise resignation, the shares of the Gujarat-based fruit juice manufacturer slumped to Rs248, down by almost 40 per cent, in just four trading sessions. 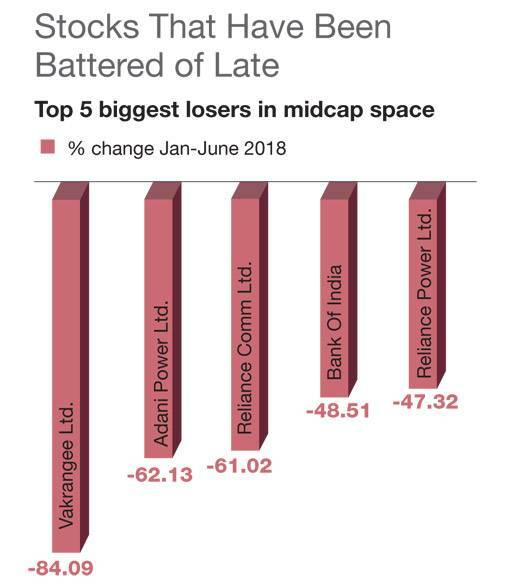 Mumbai-based Technology Company Vakrangee Ltd., which ironically provides solutions for e-governance, tops the charts for midcap losers this calendar year. The stock has fallen over 84 per cent between January and June 2018. Here, too, the auditor quit and in July alone the stock, disappointing investors, gave negative returns of 24 per cent. Shriram says, "Investors tend to rely on the veracity of audited financial statements. Hence, resignation of auditors raises many red flags and investors then suspect that the management is hiding information." ?This triggers a no-confidence motion among the investing community and markets punish companies suspected of being run badly. Government companies face a peculiar problem. Oil and Natural Gas Corporation Ltd. (ONGC) was recently coerced by the government of India (GOI) to buy a 51 per cent stake in oil and marketing company HPCL (Hindustan Petroleum Corporation Ltd.). This reflects poor capital allocation strategy and sends a wrong signal to investors about the entire PSU sector, say experts. Prudent allocation of capital is a mark of good governance but both ONGC and LIC-IDBI deals, says Shriram, were "deals of convenience"? (LIC was asked to buy a majority stake in the troubled bank). PSU banks, on the other hand, have been victims of frauds and high NPAs. Even as bankruptcy clauses are being tightened, the damage has already been done. The PSU bank index has given a negative return of 15 per cent since June 2017. And this is at a time when both broader markets and headline indices rallied high. While the Nifty gained 28 per cent in 2017 and the midcap index added 48 per cent, the ongoing calendar year has not been a smooth ride, leaving investors and fund managers scratching their heads. 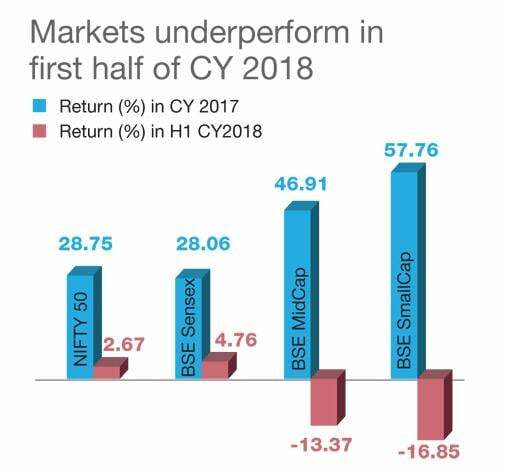 Midcap and smallcap indices have given negative returns of 13 per cent and 16 per cent, respectively, between January and June this year. Multiple moves by the government and regulatory agencies in the last few months have had direct and cascading effect on the market.? The introduction of capital gains tax on long term equity investments by Finance Minister Arun Jaitley, categorisation and restriction of bulk of mutual fund investments into top 250 stocks, Sebi's introduction of a new risk mitigation process known as Additional Surveillance Measures, higher margins and deteriorating macros due to rising oil prices trade war and weakening rupee - all of these have caused jitters in the market. These steps have deepened the slide in the broader market, sucking out liquidity from midcap and smallcap stocks. Mahesh Patil says, "Last financial year, we saw mutual fund inflows to the tune of Rs20,000 crore every month, but from the beginning of this financial year, we have seen that coming down by 40 per cent to Rs12,000 crore." Currently, even though July has seen some kind of a soft reversal for FII inflows, the first half of 2018 has been one of the worst periods for foreign fund outflows. From January to July this year, foreign investors sold equities worth $550 million and debt outflows stood at $6 billion. Meanwhile, Domestic Institutional Investors bought equities at their slowest pace since January this year, but Mahesh Patil says passive investments into exchange traded funds to the tune of Rs2,000 crore every month are continuing. "But they only invest in large index stocks and which is why valuations of large caps are a bit stretched currently," explains Patil.? However, some Oil Marketing Companies (OMCs), select metal and financial services companies, barring private banks, are trading significantly below their long-term average multiples. Investors could find good bargains in these spaces, say experts. Aashish Somaiyaa says, "A lot of large FMCG names are getting overpriced according to us. Similarly, not all large IT companies are demonstrating secular trends and even in pharma and PSU banks one has to go case-specific." Investing in individual securities after thorough due diligence is what investors need to do. Midcaps are not at distressed valuations and one can slowly build positions in them. Motilal Oswal AMC, among a few others, has started investing in mid and smallcaps, especially because the regulatory diktat has resulted in Rs7.5 lakh crore of mutual fund money being locked into the top 250 stocks by market cap. Besides, the June quarter earnings season has been favourable for many companies whose stock prices had corrected sharply. This has boosted investor sentiment in the markets. 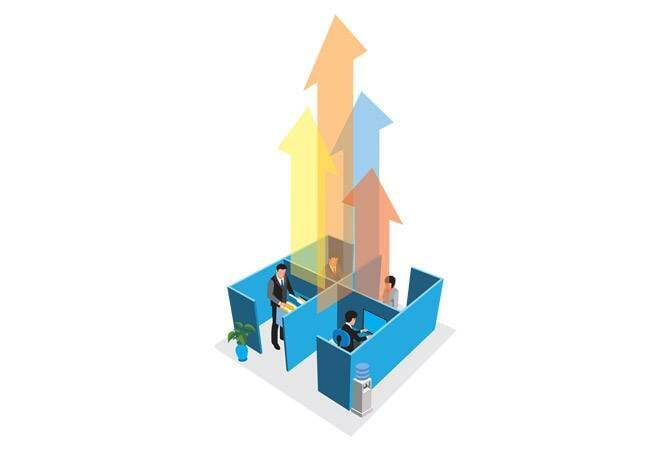 Aashish Somaiyaa of Motilal Oswal says, "In general there is expectation that PSU bank woes should recede from here on in terms of fresh accretion to declared NPAs and coupled with already robust sectors like private banks, NBFCs, consumer discretionary and staples, autos, etc, we will see high doubledigit growth in FY19 earnings." But a wary Mahesh Patil differs and gives us a fairly cautious estimate of 9 per cent earnings growth over the next seven-eight months and 13 per cent growth in equities over the next two-three years. With a few state elections due later this year along with general elections in 2019, one is unlikely to witness any substantial FII inflows. The risk of a higher-than-budgeted fiscal deficit could also be on the cards. But experts say that strong growth in both 2018 and 2019, driven by consumption, exports, government spending and perhaps a nascent recovery in private capex, would continue to maintain the momentum and euphoria in the markets. Thus, one needs to watch out if indeed the corruption and poor governance in India Inc. reduces while politicians sell the India growth story and its tremendous potential in the run up to general elections. Meanwhile, markets will keep looking for a new investment narrative that protects investor interest.